Ocean to Table is a program at Chief Kitsap Academy designed to give students a hands-on learning experience that incorporates science and culture by taking them on the journey that fish make, from the ocean to their dinner tables. Suquamish Fisheries Director Rob Purser shows Chief Kitsap Academy Students how to maintain salmon fishing nets. One very cold mid-November morning students in the marine biology class at Chief Kitsap Academy found themselves out on Dyes Inlet learning how to catch chum salmon. Jay Mills, his brother David, and Rob Purser provided the boats, equipment, and expertise, and generously gave their whole day to provide the first stage of a “start-to-finish” chum salmon fishing project. Students were prepared through classroom activities about outfitting a fishing boat. Boots and raingear provided by the school and loaned by the Tribal Fisheries Department, so students were ready to brave the cold and participate in a day of hard work on a gillnetter. The project ended days later with delicious salmon that was smoked, canned, and ready to eat. This innovative activity was the brainchild of Tribal Councilmember and Kiana Lodge manager Jay Mills and Randi Purser, language and cultural teacher at CKA. They realized that although just about everybody loves smoked salmon, most students had no idea of the energy, patience, and effort it takes to produce one jar of smoked salmon. The project was incorporated into the salmon unit of the CKA marine biology curriculum by Marine Biology teacher, Karen Matsumoto. Students learned about chum salmon life history early in the school year, and conducted macroinvertebrate sampling at Cowling Creek with Paul Dorn, Suquamish Fisheries biologist, and with biologists from the Washington Department of Fish and Wildlife and Kitsap County. Students also conducted stream habitat investigations, monitoring water chemistry and stream health. In late October, they saw chum salmon swimming upriver to spawn on Suquamish tribal lands for the first time in almost 100 years, thanks to the new fish ladder built by Trout Unlimited volunteers. There was a field trip to the Grover Creek hatchery and classroom dissection activities. After investigating the internal anatomy of salmon, students practiced filleting the fish, an essential step in preparing them for smoking. The November day on David’s and Jay’s boats included setting and pulling nets, disentangling salmon caught in the nets, and dealing with the unusual numbers of sea jellies encountered in Chico Bay. Over 50 salmon were caught that day and by the end of the afternoon, the students were throwing fish like Pike Place Market fish vendors! They helped pack the fish for processing and met at the Community House the salmon the following day to continue their work. Jay Mills taught students how to clean and prepare fish for smoking, using his grandmother’s trick of placing the salmon on a bed of ferns to hold the fish in place and absorb the blood. It was an all day effort to clean and process the fish, ending with the salmon fillets carefully packed with salt and sent to the smoker! Students helped tend the fire in the smoker, and learned about the smoking process. When the fish was ready, we met Jay at the Kiana Lodge kitchen for canning. About half the fish was smoked, resulting in seven cases of pint jars of first-rate salmon. The flavor was heavenly! These jars will be used as gifts to honor speakers and elders who come to the school and some may be sold for a school fundraiser. Inspired by the success of this venture, Karen and Jay are developing a chum salmon fishing curriculum, so the program can be streamlined and duplicated every year. This intensive project, extending over three weeks, was well worth the time and effort. 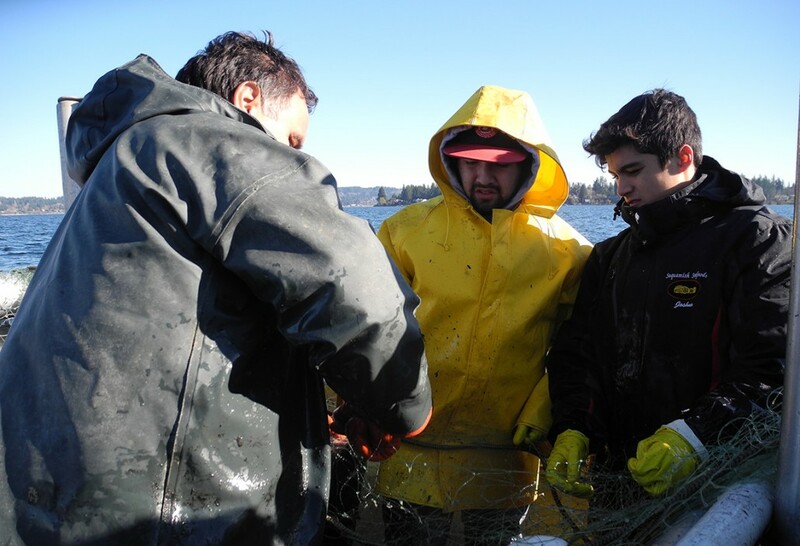 Students gained hands-on experience in the Tribe’s local chum fishery, learned how to process and preserve salmon, and gained another important connection with their Tribal heritage. Making Waves at CKA Ocean to Table Video!